NOTE ABOUT OFFICE HOURS: Hours apply to normal business days, but our offices are closed on university holidays. Visit This Link to see the most updated list for staff holidays. 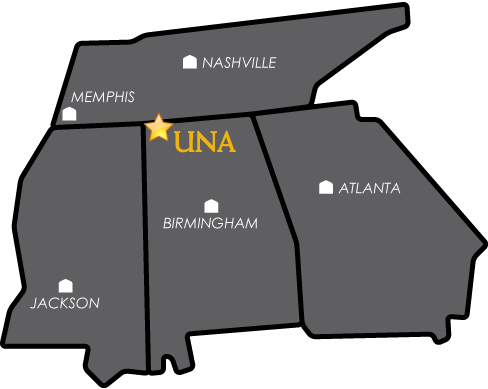 The University of North Alabama maintains a comprehensive Local Area Network (LAN) connecting the majority of buildings at the UNA Main Campus and UNA East Campus to each other. This high-performance connection is through a combination of 1 GB and 10 GB fiber optic cable and Cat 5e and Cat 6 cable. The faculty, staff and students have access to the Internet, UNAPortal (including Banner), Canvas, Office 365, and many other applications. Wireless access is available in 100% of the buildings on campus. UNA's email filter, Proofpoint, is a replacement for Microsoft Outlook's built-in Clutter and Junk Folders. For instructions on disabling Clutter and Junk, check out our Email, Calendar, Storage How-to & FAQ. The Email, Calendar, Storage section of our site also includes information about setting up Outlook/Office 365 on mobile devices, Office 365 features and more. For more information about managing Proofpoint and how it works, go to our Proofpoint Email Filter page. Students - get FREE Microsoft Office here! Click HERE for information about how to get started in Office. Information Technology Services’ (ITS) mission is to provide secure, reliable, and integrated technology solutions in an ever-changing technological landscape to support the University community in alignment with the University Mission and Strategic Goals, while delivering excellence in customer service. Collaborate with the University community and outside entities to understand University technology and infrastructure needs and implement cost-effective, full-functioning solutions. Ensure that all members of the University community can access and utilize the technology necessary to fulfill their roles, both academic and administrative. Maintain open communication channels between ITS and the University community. Strive to deliver timely and effective responses to individual and organizational requirements by developing and maintaining customer-oriented and technically skilled staff. Implement security technologies and training as part of the University’s effort to protect both its community members and its information. Continually assess existing and emerging technologies and seek to implement appropriate hardware and software in order to enhance individual and organizational effectiveness and experience. ITS Help Desk for help changing your password.